Your health is important wherever you go. On average, Americans working full-time spend more than one-third of their day, five days per week at the workplace. The use of effective workplace programs and policies can reduce health risks and improve the quality of life for American workers. The Centers for Disease Control and Prevention is the perfect resource for learning more about Wellness at Work. What is a Workplace Health Program? A workplace health program is a health promotion activity or organization-wide policy designed to support healthy behaviors and improve health outcomes while at work. These programs consist of activities such as health education and coaching, weight management programs, medical screenings, on-site fitness programs, and more. Workplace health programs also include policies intended to facilitate employee health, including allowing time for exercise, providing on-site kitchens and eating areas, offering healthful food options in vending machines, holding “walk and talk” meetings, and offering financial and other incentives for participation. Effective workplace programs, policies, and environments that are health-focused and worker-centered have the potential to significantly benefit employers, employees, their families, & communities. 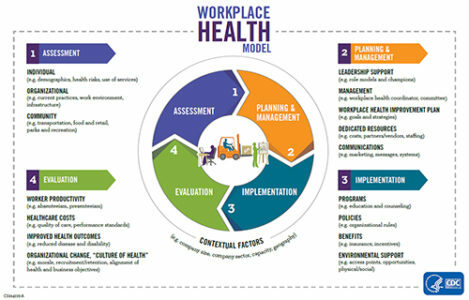 Workplace health programs can lead to change at both the individual (i.e., employee) and the organization levels. 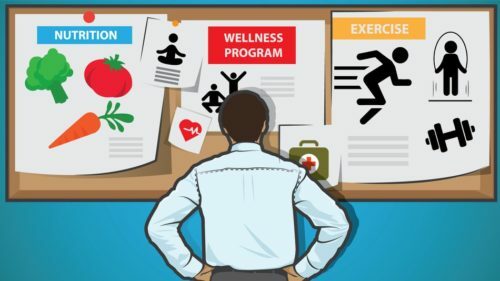 For individuals, workplace health programs have the potential to impact an employee’s health, such as their health behaviors; health risks for disease; and current health status. For organizations, workplace health programs have the potential to impact areas such as health care costs, absenteeism, productivity, recruitment/retention, culture and employee morale. Employers, workers, their families and communities all benefit from the prevention of disease and injury and from sustained health. 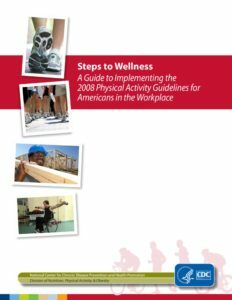 Steps to create, maintain and sustain physical activity and wellness programs. For more information on the Steps to Wellness tool kit, visit the Centers for Disease Control and Prevention. Evidence suggests that most Americans need to get more physical activity. Two-thirds of people in the United States weigh more than they should and nearly three-quarters don’t get the recommended 30 minutes of physical activity on most days. Because many adults spend 20, 30, or 40 hours or more a week at work, adding physical activity to employee’s workdays may be one way to help working Americans become healthier. Walking or biking to work is one way to increase physical activity, but for many people it isn’t an option. However, for many employees, walking while at work is a way to increase their physical activity. But how safe and attractive is the walking environment at your work place? To find out, use the CDC walkability audit. For more information on walkability, visit CDC. Walkability is the idea of quantifying the safety and desirability of the walking routes. At work, these can be streets and sidewalks in between buildings on your campus, city blocks if you work in a downtown area, or even walking or nature trails at your work. Many people work on campuses that have more than one building, and they might work in one building and have meetings in another. 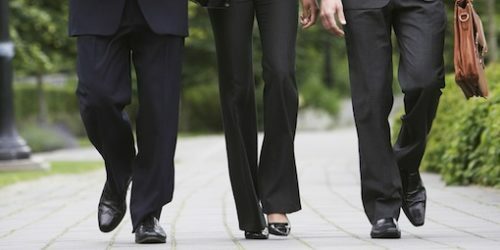 Do your employees walk to those meetings, or drive? Do they walk for exercise or recreation at lunch or during breaks? Do they walk to restaurants or parks to have lunch? Sometimes people don’t walk at work because they don’t feel that the walking routes are safe or convenient. There is scientific evidence that providing access to places for physical activity increases the level of physical activity in a community. A tool designed to help employers assess whether they have implemented science-based health promotion and protection interventions in their worksites to prevent heart disease, stroke, and related health conditions such as hypertension, diabetes, and obesity. Know where your worksite stands. 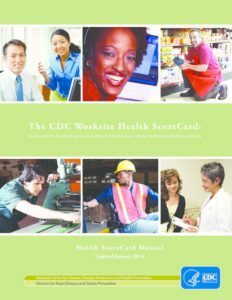 Review the CDC Worksite Health Score Card to better assess health promotion program, identify gaps, and prioritize high-impact strategies to prevent heart disease, stroke, and related conditions. 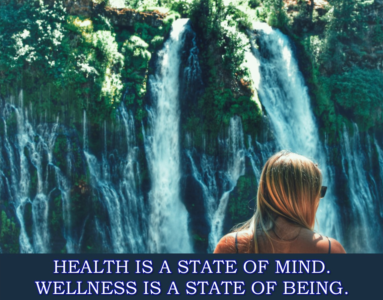 Shasta County is full of Wellness Champions. Check out Healthy Shasta’s partners who are Wellness Champions.